We are just weeks away from releasing the BPW4W top 10 of 2014--so get excited! Our top women's pre workout awards were incredibly well received last year, and we have a slew of products still to come in this years edition. We have already reviewed several exciting new products like Promera Women's Elite and Ab Cuts Sleek and Lean. 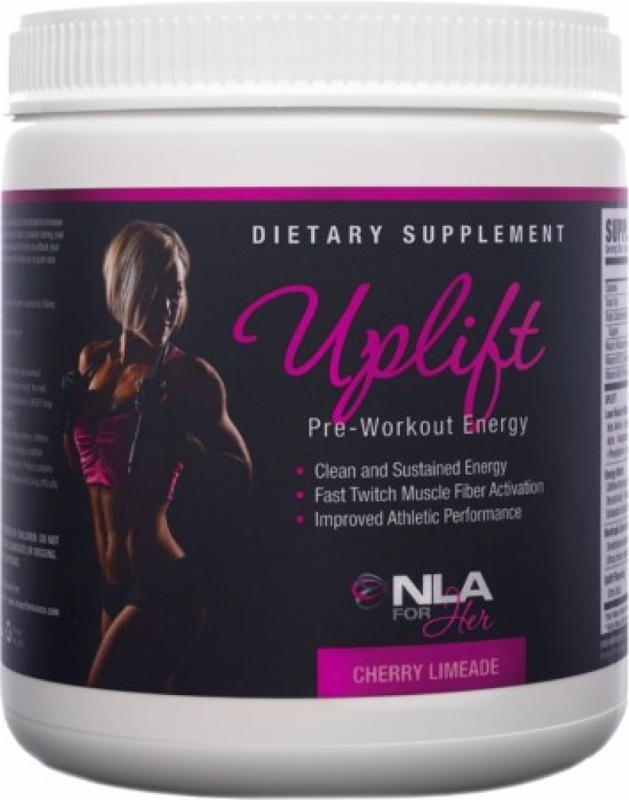 Can NLA's pre workout for women 'Uplift' hang with the best? Will it crack the BPW top 10 of 2014? Here's our official review and grade of NLA Performance's women's pre workout energy offering- give it a share or connect with me on Twitter and let me know if you agree! NLA Performance currently offers two flavors of Uplift pre workout- cherry limeade, or raspberry lemonade. The combination of sweet and tart is a common theme for his year, as we have noticed several companies combining a sweet and fruity flavor with citrus. Having sampled several raspberry lemonade concoctions in my day, I tried this flavor because I have a good idea of what I like raz lemonade to taste like. NLA sort of missed the mark in my opinion with this version of the raspberry lemonade. I prefer this flavor to lean a little more heavily toward the tartness of the lemon- much like it would in a real glass of raspberry lemonade. I also am very sensitive to things that are overly sweet. This tasted very sweet, and not very citrusy to me. I also wasn't crazy about their version of the 'lemonade'. It was that super-artificial lemonny taste that you would get in a lemon-drop or a warhead (remember those?!). Some people love that flavor though- so if this is you- Uplift's raspberry lemonade is for you! I gave the taste a 7.4 because it was just slightly below average for me. It was drinkable, but not something I would look forward to every day- which is the effect I am looking for. On first glance, the ingredient profile in NLA for her is above average and pretty strong. I appreciate a pre workout (especially a women's one) that excludeds creatine, which this one does. I also appreciate the beta-alanine, even though it makes my skin rashy. The team at NLA also pieced together a respectable amino acid profile, and a pretty good nootropic (mental/focus ingredients) blend. All of the BCAA's are in the amino blend, and vinpocetine has always been one of my favorite ingredients to run alongside caffeine. Other nootropics such as PABA and DMAE are also included to enhance the mental focus side of your workout. The verdict is not really out on many ingredients like the two afore-mentioned, as there is a lack of scientific research to back up any claims. However, some people swear by their effects. I personally only really 'feel' caffeine, and as I said before I think I can notice the vinpocetine because caffeine alone will make me pretty jittery. On second glance, and the reason why this product scores so low in this category, is the fact that NLA chose to hide the ingredient profile in proprietary blends. As someone who is very careful about what I put in my body- I feel really uncomfortable taking supplements that don't feature full label transparency (such as Toned) What's even worse than that, is the fact that when you add up the quanities of the three blends- you get a number just over 2 grams. Then looking at the serving size- you can see that it is 7 grams. That means one thing- and, in my own opinion, it is one of the WORST things. 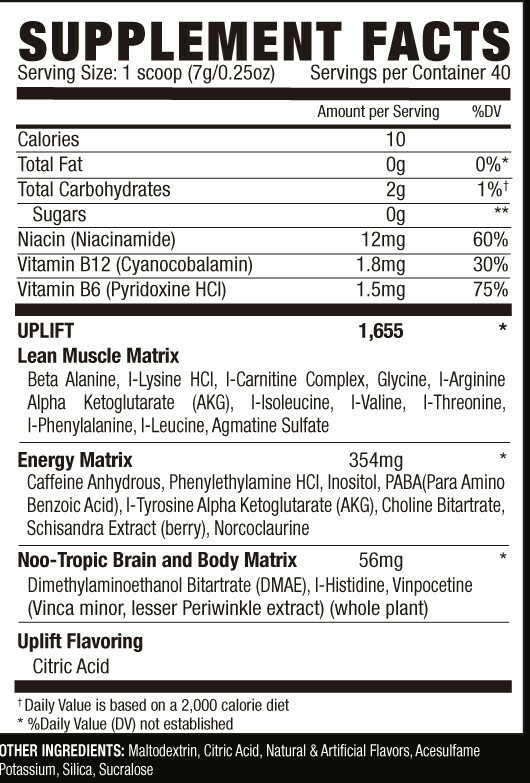 This formula is mostly filler- or maltodextrin (you can see it listed in the 'other ingredients' section). 5 whole grams out of 7 are just filler. So yes the ingredient profile looks pretty good- but it is dosed so scantily that it just doesn't deliver as good as it should because there just isn't alot of active ingredients in it. With this knowledge, I did not have very high hopes for the performance of this product. This performance test was done with some of my fitties at our new Barry's Bootcamp (highly reccommend these workouts!). For those of you unfamiliar, Barry's workouts combine varied intensity treadmill intervals with high-volume strength training- and the result is total exhaustion but incredible results. The workout we did used a single dumbbell for the strength portion- and tons of core moves like situps, woodchops, and lateral shrugs. We all used 1 scoop about 20 minutes prior to the start of the workout. My personal experience was fairly positive. I felt the beta-alanien kick in about 5 minutes after drinking NLA Uplift mixed with my 12 oz bottle of water. I also felt the caffeine kick in about halfway through the opening treadmill warm-up, which was a ten minute cycle of gradually increased intensity using the incline and speed controls on the treadmill. After my first session with the weights, I really felt pretty good and focused- most likely a result of the nootropics (namely the caffeine). As the workout progressed, my fatigue level stayed in check- I didn't feel invincible like I do with some of my favorites like Toned or Fem-Fire, but I also could tell that I had a little extra to give, and this was a really nice effect during such a strenuous workout. After re-convening with the team, the others agreed that the prodcut performs better than expected giving the forula. My friend Sarah probably put it best: "I felt like I was performing slightly better than the effort I was giving- and I was going all out". This and other positive feedback from the team lead to a really respectable 8.5 rating in the all-important performance category. Even though I have some issues with the way this product is formulated--the most important thing that influences our rating of value is the way the products actually perform during the workout. At the end of the day, a pre workout product really needs to be judged on the workout itself- and that's why we've given Uplift a very fair 8.3 score on overall value. Another key factor impacting this overall positive score is the price of NLA for her Uplift. At $34.99 for 40 servings, Uplift is a very reasonably priced product that does what a pre workout should do- enhance the workout experience. Ok so there are definitely some pros and cons here. The pros are that the shiny pink, in contrast to the matte black works very nicely. I also like that NLA kept the layout relatitely simple, and for the most part- very feminine; but not insultingly so. That being said, there are two issues I have with this design. First is the black label on the cheap white bottle. This is just an awful juxtaposition, and a blatant reflection of someone at NLA refusing to shell out for the black bottle- because the black bottle was clearly in the plan. No designer in their right mind would throw the black label over the white. Second, although the label itself isn't all that bad- they couldn't have gotten any lamer with their color selection. Like how many times are we going to see black and pink people? It's just plain stale at this point. The last thing to note is the cropped picture of Jessie Hilgenbergcovering the main face of the label. Jessie is a well-muscled and beautiful woman to be certain, but I don't know if I need a picture of her half-naked body on the product that I bring to the gym--I'm a grown woman. In summary, Uplift may not be the most brilliantly formulated product in the cateogry. It may not be the sexiest package on the shelf. But it delivers a nice clean boost for even the toughest of workouts- and most likely deserves a try next time you are on the market for a pre. NLA For Her Lean Protein Bars, Better Than You Expect..